The stars in the sky are not distributed evenly. When we look at the sky from a dark site (out of the city) we can see a faint fuzzy band of light circling the sky. The fuzzy band reminded the Ancient Greeks of spilt milk, so they called the band the Milky Way. The Greek word for milk is gala and in Greek the word for Milky Way is Galaxy. Today we use the word galaxy to describe any large collection of stars. In the winter sky you can see the Milky Way pass through the "feet" of Gemini, through Auriga, through the "head" of Perseus and into Cassiopeia. Through a telescope (or binoculars) you can see that there are many more stars in the regions in and near the Milky Way than in directions far from the Milky Way. The Milky Way is composed of lots of stars, most of which are too far away for us to resolve. Instead of seeing lots of point-like stars, we just see a fuzzy glow from the added light of the stars. 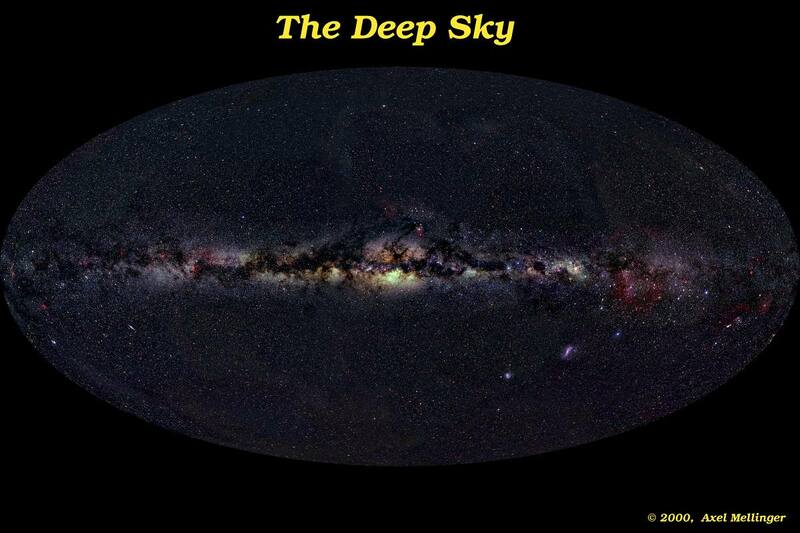 A photo of the stars seen in the sky, mapped to a rectangle aligned with the Milky Way is shown below. 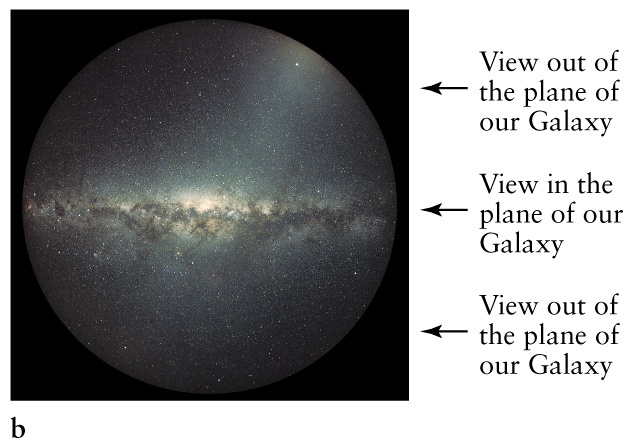 Is Our Galaxy Shaped like a Sphere? The fact that the Milky Way is a thin band that circles our sky gives us a clue about the shape of the Milky Way. If the Milky Way was a large spherical distribution of stars like the elliptical galaxy M87 then if we were near the centre, we would see the same number of stars in all directions. This is not what we see. Therefore the Milky Way is not an elliptical galaxy. 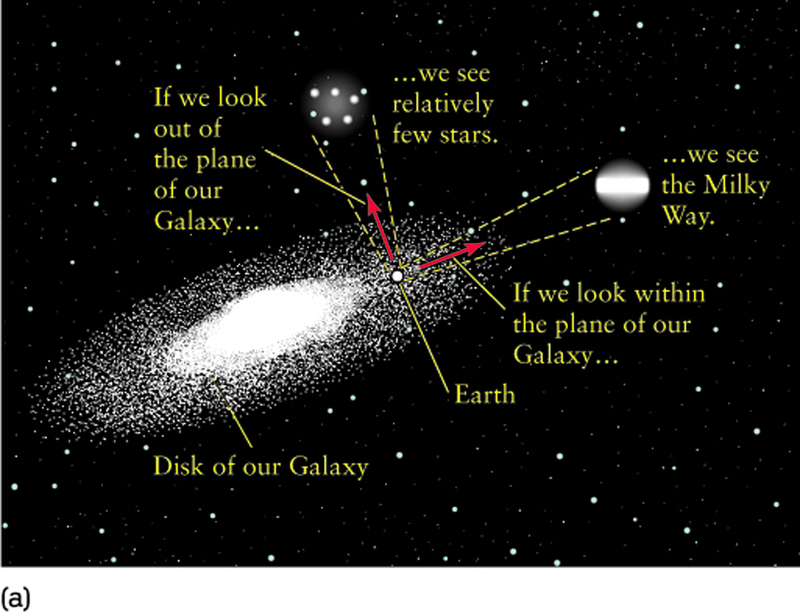 Is Our Galaxy Shaped like a Disk? 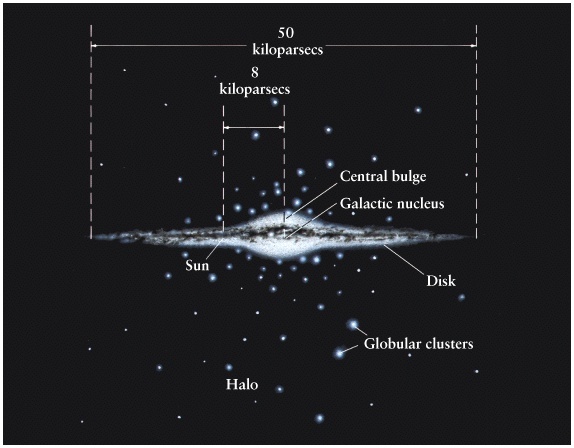 Suppose that the Milky Way's stars are arranged in a disk-like shape and that the Sun is somewhere inside the disk. The photo to the right is the Andromeda Galaxy (also known as M31) which is a "nearby" spiral galaxy. 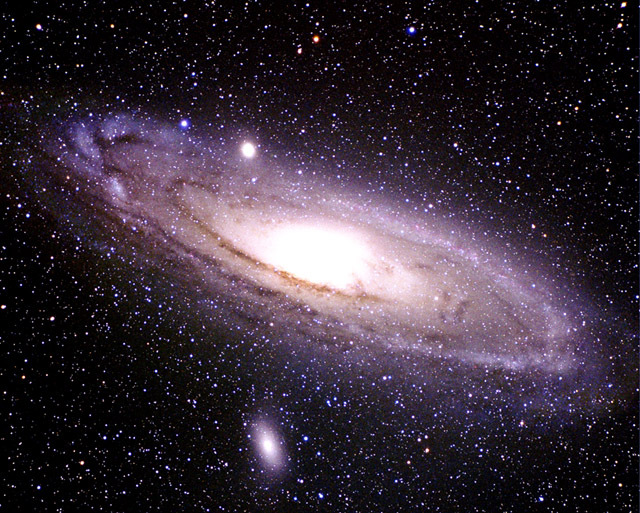 Andromeda has about 100 billion stars concentrated in a disk with a diameter of about 100,000 pc. The bright central core has a very high density of stars. How does the Sky Look from Inside of a Disk Galaxy? Lots of stars when we look in the plane of the disk. Very few stars when we look out of the plane of the disk. We should see more stars when we look towards the centre of the disk than away from the centre. This agrees with our observations! This suggests that the Milky Way might look like Andromeda if we could fly out far from the galaxy and take its photo. And the the Sun is not at the center of the Milky Way ! This was not, however, an easy observation, due to extinction. W. Herschel in 18th century concluded that we are at the center. 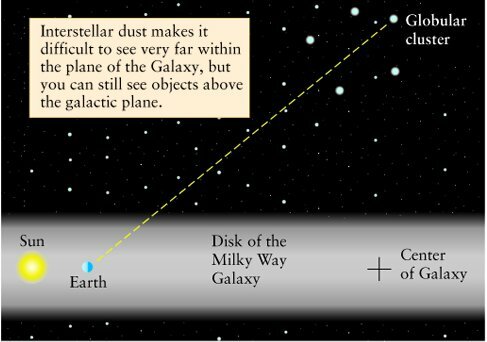 In 1917 Harlow Shapley decided to measure the size of the Milky Way by finding the distance to special star clusters called globular clusters using a variable star period-luminosity relation. Globular clusters are spherical balls of over one hundred thousand stars (some have more than a million stars). 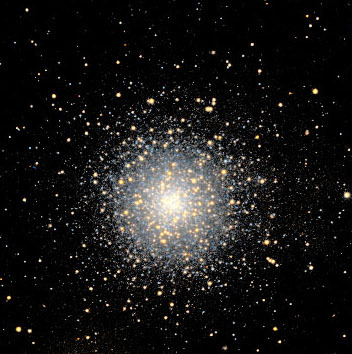 Globular clusters can be seen in any direction of the sky, not just the plane of the Milky Way. One nice example is the globular cluster M13 found in the constellation Hercules which can be seen during the summer and autumn months. Harlow Shapley found at least one variable star in each cluster. 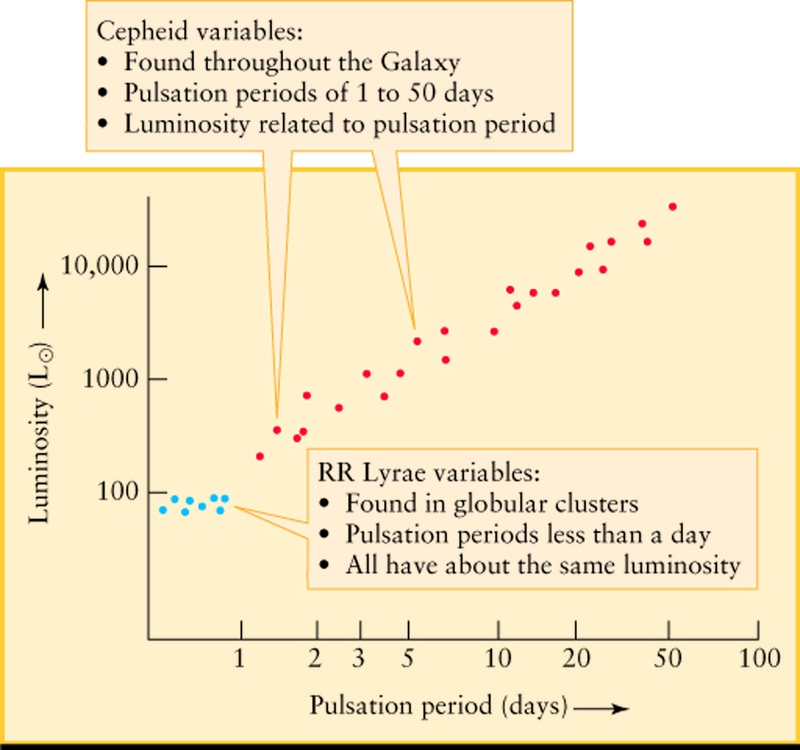 Using the known period-luminosity relation, he then found the distance between the cluster and us. This allowed him to make a 3D map of the clusters of our galaxy. He found that the clusters were distributed in a spherical cloud with radius at least 10 kpc. The centre of this cloud is not at the Sun. Instead the centre of the cloud is 8.5 kpc away from the Sun. The Sun is not at the centre of the Milky Way galaxy. A side-view of the Milky Way is shown. 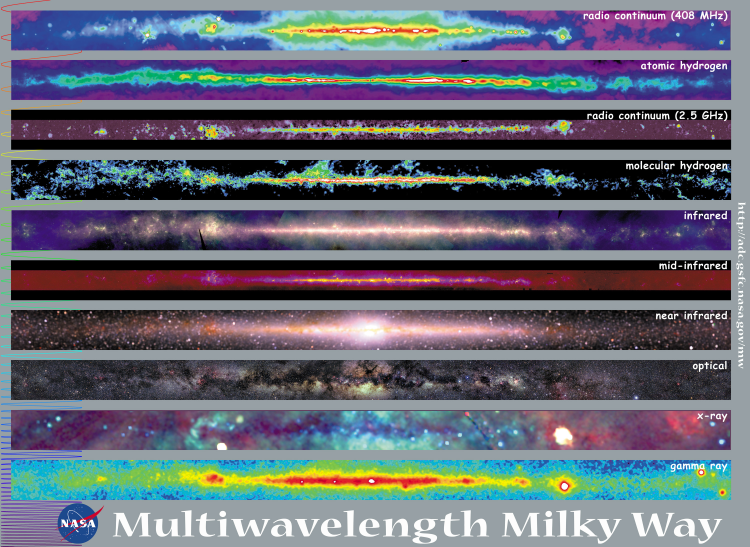 The top view shows the size and structure of the Milky Way which was accepted before Shapley. The bottom view shows the accepted structure of the Milky Way after Shapley. A disk of stars which include the Sun. The stars in the disk are thought to form a spiral pattern. A large spherical halo where the globular clusters reside. Stars in the disk are mostly young, metal rich ( Population I , stars formed from material processed by previous generation). 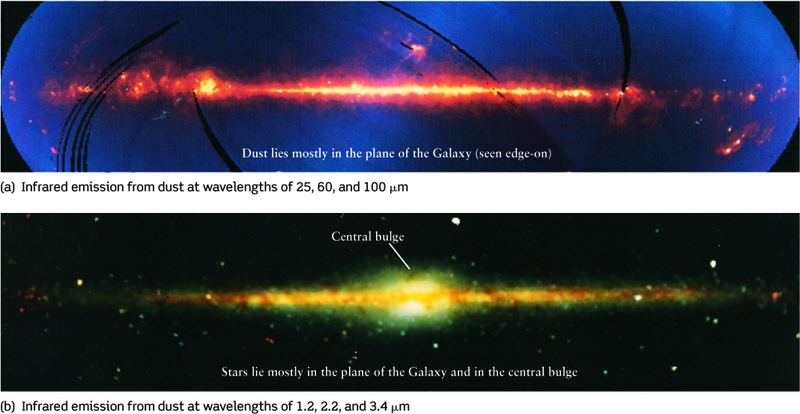 Disk is the place of star formation ! Central bulge contain both Pop I and Pop II stars but no young luminous O ang B stars - no current star formation there.